Driving your own dog team on the Russian border is an experience you will remember for the rest of your life. 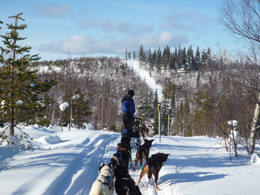 The start is exhilarating (and quite difficult for beginners) but the dogs soon settle down to a good pace and you will be left in "the heart of silence" except for the occasional creak from the wooden sleds. As you travel across frozen lakes and through ancient forests a sighting of reindeer, elk or a group of snow grouse can suddenly break the tranquillity and you will be doing well to control your team as the dogs take up the chase. With a race trained team and a strong lead dog you should still manage to keep to the trail and cover some good ground at a pace that can easily take you 100km in less than a day. However far you go, the bonds between man and dog, dog and forest, will take you further than you imagined possible. 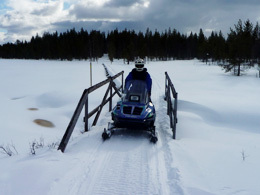 Snowmobile provide our guests with a completely different mode of winter transport. With their powerful engines they are a useful working tool here at the Border Inn - making trails and shifting people and equipment when our dogs are resting. They are also very fast and highly manoeuvrable! Driving techniques (and abilities!) vary greatly, but with patience you will gain a degree of mastery of their prestigious capabilities. If trail conditions and confidence allow you may reach speeds in excess of 100km/h. It can be just as challenging to weave your way through a tight forest trail at far lower speeds, or wade through deep snow with the correct use of balance and throttle. 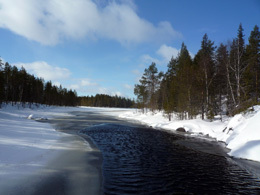 Great distances can be covered in only a few hours on the snowmobiles. A coffee break at an open fire provides views of the rapidly setting arctic sun in the west and Russia to the east. The return journey in darkness provides new challenges as your ability to judge speed and distance (and to see trees!) becomes impaired despite the best efforts of your snowmobile's powerful headlights. Sauna and dinner are waiting for you at the lodge - so drive carefully, there's always tomorrow! 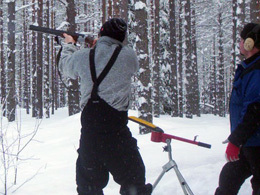 Depending on the time of year and your own personal preferences there are many other activities worth pursuing in the vast natural wilderness that surrounds the Border Inn.